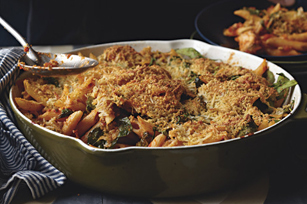 Pasta sauce and a Parmesan topping give this easy weeknight chicken and pasta bake terrific flavour. Cook pasta as directed on package, omitting salt. Meanwhile, heat oil in large ovenproof skillet on medium-high heat. Add chicken; cook and stir 5 to 6 min. or until evenly browned. Stir in pasta sauce. Drain pasta, reserving 1/2 cup cooking water. Add pasta and reserved water to chicken mixture in skillet along with the spinach; mix lightly. Combine seasonings and cheese; sprinkle over pasta mixture. If you don't have an ovenproof skillet, you can use a regular skillet instead. Just wrap handle with several layers of foil before using as directed.